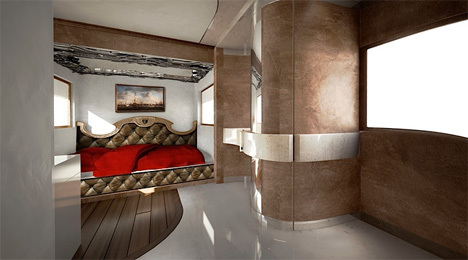 Driving around the country in an RV is not the first thing most of us think of when the word “luxurious” is mentioned. 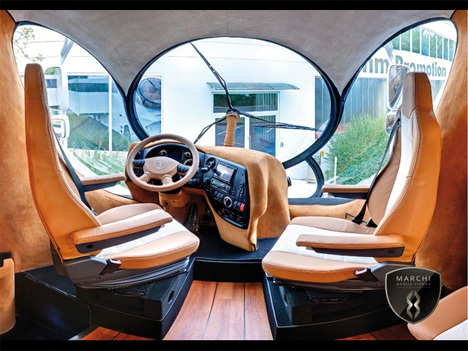 Perhaps the futuristic luxury RVs from Marchi Mobile Vehicles will change that. 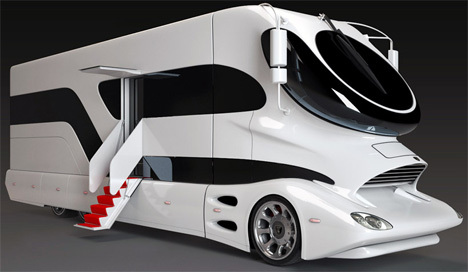 The slightly strange-looking RV is based on the strikingly futuristic truck designs of Luigi Colani. 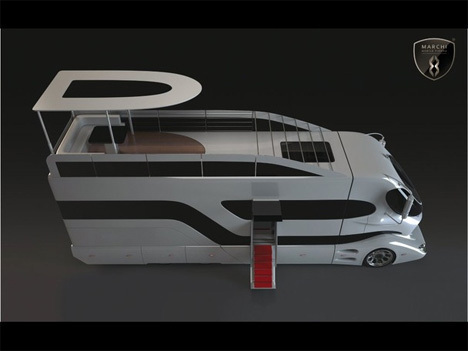 Like Colani’s trucks, the eleMMent RV sports some truly crazy looks and over-the-top parts. The 38-foot-long, 13.5-foot-tall RV boasts around 500 square feet of usable interior area, making it larger than some apartments. 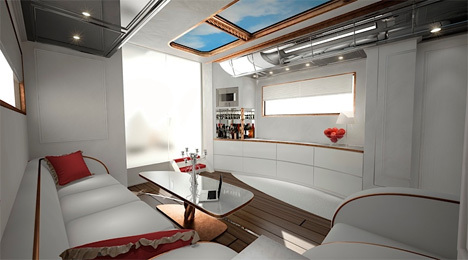 The push of a single button causes a large “sky bar” to rise from the top of the vehicle, letting residents and guests party under the stars in style. But a pop-up bar is just the tip of the ultra-luxurious iceberg. The eleMMent also features a huge master bedroom with a 40-inch flat screen TV, a gorgeous spa bathroom and, oddly enough, a fireplace. Lest your exceptional vehicle ever look like it has actually been driving around on dusty roads, the eleMMent features an integrated vehicle cleaning system to keep the paint job looking nice and fresh. The specific amenities on each eleMMent can be changed around and customized based on each buyer’s preferences. 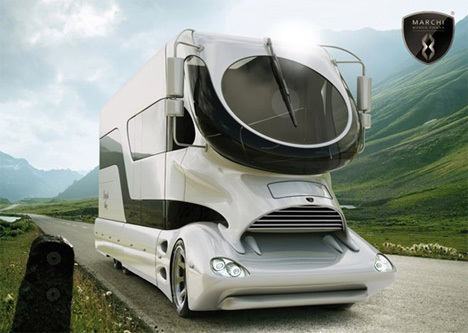 Although there are not many actual photographs of the ultra-cool RV, there are plenty of renderings to ogle. Provided you can afford one, you can order an eleMMent today with your individual preferences in place. Just remember the traditional wisdom: if you have to ask how much it costs, you can’t afford it.